An EU laboratory in Rome says there’s no reason to suspect that the new outbreak of E.coli has come from vegetables. 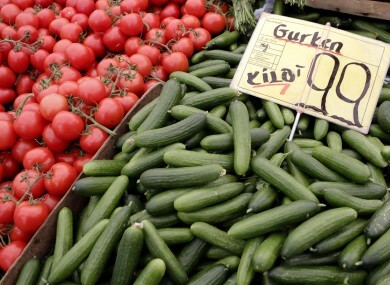 Tomatoes and cucumbers from Holland are displayed for sale at a market in Berlin. An EU lab has said there is no reason to suspect vegetables as being the source of the new E.coli outbreak. THE EU’S REFERENCE laboratory for E.coli has said there is no reason to blame vegetables for the outbreak of a new strain of the bug, which has now claimed 19 lives. The laboratory, based in Rome, said there was no reason for “alarmism” over the consumption of certain vegetables in light of the outbreak, which originated in northern Germany and which has now spread to 12 European countries. “Alarmism over the consumption of vegetables is not justified… since laboratory analyses do not support the hypothesis that contaminated vegetables were the source of the infection,” its statement said, according to Fox News. The lab suggested that the usual precautions – of washing your hands after handling food, and ensuring that knives are suitably cleaned – should be enough to ward off the strain. It also added that the new O104:H4 strain should not be considered a ‘mutant’ strain, but rather an older one which has acquired new genes. The head of Germany’s Nephrology Society has told reporters in Hamburg that the rate of new infections has stabilised, prompting hopes that the outbreak might be decelerating. That country’s medical authorities have appealed to the public to increase blood donations, after stocks became significantly depleted given the extra volume of hospital admissions resulting from E.coli infections. Dr Eleanor McNamara, director of the HSE’s public health laboratory, said yesterday that the volume of cases being registered in Germany meant it was “inevitable” the bug would eventually show up in Ireland. Email “"No proof" that vegetables to blame for E.coli outbreak”. Feedback on “"No proof" that vegetables to blame for E.coli outbreak”.